It was the children's very first ice skating experience. And again, I am thankful to be able to enjoy their first moment. The joy of being a mother is indescribable. My older kid just stepped into the rink and skate! It seems so easy to her. Perhaps, her experience in inline skating helped her. My younger kid walked into the rink and hang onto the bar. The right side of the rink is a seating area with tables and chairs. There is a small cafe serving beverage and pastry. I like this place so much. It has glass window with bright sunlight shone it and outside view as well. I admire her courage in letting go of the bar and ventured into the middle of the rink. What was on her mind? How did she decide to do it? Children certainly know what, when and how they want to do. Don't you think so? Ice skating rink rates is RM22 (including skates) per entry for weekdays. I paid RM5 per entry to sit at the cafe by the rink. Bring your own gloves and socks. Alternatively you can purchase them at the rink. Smales counter in front of Smaland, Ikea. The application is free and you need to bring the child 's identification card. I like the Smalish dallars (currency of Smales) benefits where kids will do some math here to redeem the Smales merchandise. They were given a newsletter and a lanyard with pocket to store their booklet. Each sticker (yellow round sticker on the booklet) is 0.50 smalish dallars. When you visit Smales, you are entitled to one sticker. My older kid was counting how many stickers will be equivalent to 10smalish dallars to exchange with this piece of T-shirt. There are so many wonderful values to live by. Which ones are most important to you and your family? 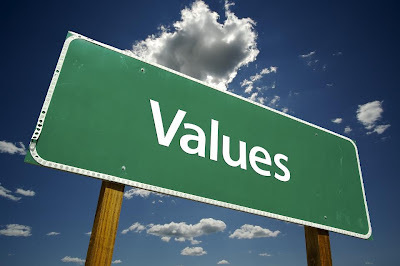 What values do you want to instill in your children? What values do you want them to find out? Today I thought about this and I feel this is education. 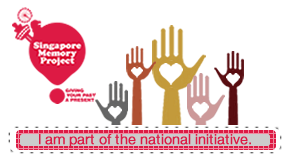 It is the Science Festival month in Singapore. 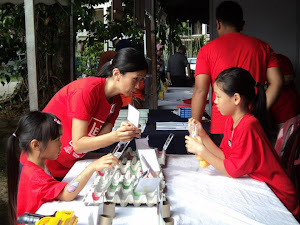 Last year, I was invited to drop by the Science Festival by a blog reader. Unfortunately, I couldn't make it. I was in awe on how much content the Singapore Science Festival has. And I thought I should just make plan and stay in Singapore for a while. We were shown how radio transmission is blocked. Just touch to activate automated door. This place is like a play area for the kids. In school, they called it studying science. So I walked past this exhibit on some trees and plants. I was offered this 'assam' to eat. Thymine, Guanine, Adenine and Sytocine. DNA is made up of these four base. I will forget these four names the moment I switch off the laptop. Drafting a design and using the colored tiles below to realize it. Seeing the pretty flower pinwheel as a prize, little kid couldn't resist but to step on the stage to answer a question. The question she got was " Is penguin a bird or a fish?". She said "Bird"
Experiment on different pH value indication. How energy is stored and released. Doing conversion of starch to glucose. Doctor Kaboom 's science show sent the audience to a fit of laughter. Yeah, the sea is so so beautiful. The water is crystal clear. The mountain backdrop is just so stunning. I thought the long achy breaky ferry ride finally paid off. 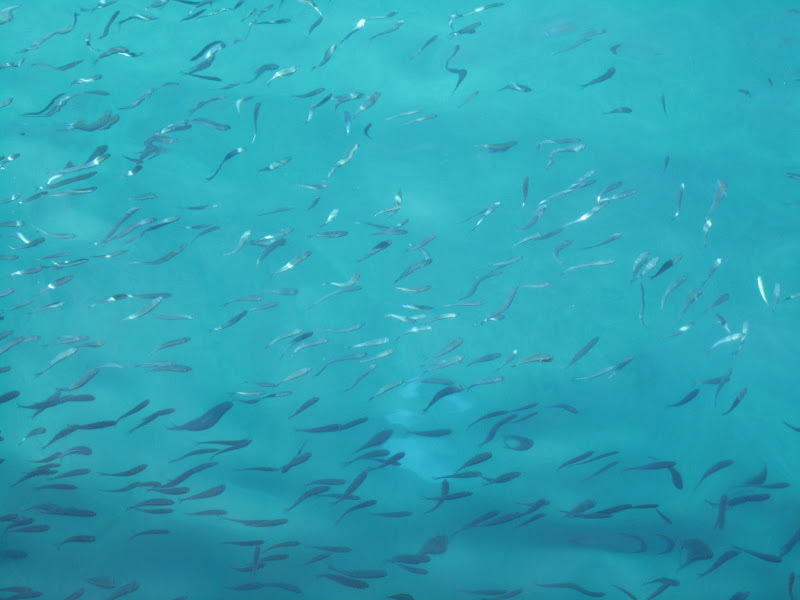 The kids' eyes were glued to the fishes underneath the water. Shortly after that, one of the few anglers caught a fish! Poor hubby has to backpack heavy luggage, tent and campbeds. Left side has lots more chalets, pubs, a duty free shop, more restaurants and shops. I prefer the right side of Salang that is quieter and lesser chalets. Salang Sayang is one of the chalet on the right side, and it is situated by the beach end. Salang Sayang Restaurant and Reception. We have booked a campsite with Salang Sayang over the phone (09-4195020). It was promised at RM30 per tent per night. A good deal, isn't it? When we have finally dragged our belongings to Salang Sayang, we were told that they didn't have any record of us coming and they said they don't do camping. No one camp here at Salang, so they said. The person whom we spoke to was out on a tour boat! We were told to try Salang Pusaka Chalet. I think I hug the older kid less nowadays. I am guilty as charged. Yes, we camped at Salang Pusaka,(Tel no. 09-419 5034/5317) located at the back from Salang Sayang. . The owner was too kind to shoo us away, even though he doesn't do camping as well. No one camp in Salang, so he said. We set our tent in front of its storage hut, by the edge of the forest. He charged us the same price, RM30 per tent per night. In place of crashing wave sound should we camp near the beach, we had noisy bats, birds chirping, insects chirping and mangoes and durians dropping sound at night. Bats were spotted swooping in and out the narrow lane, in between chalets, in the evening. We were told to use this toilet/shower just outside an abandon hall. Kids and dear hubby set off to snorkel. They went as far to the pontoon ( shown in pic) where they claimed the corals over there are simply stunning. My older one said she saw a very huge embedded clam, showing me with her open arms. I had a quiet "me" time. Just me, myself and I by the beach, with a cup of coffee and a book. Bliss, I know. I think I need that so much. "Suffering is caused by endless desire. The desire we create often generates bad karma" by Master Cheng Yen. 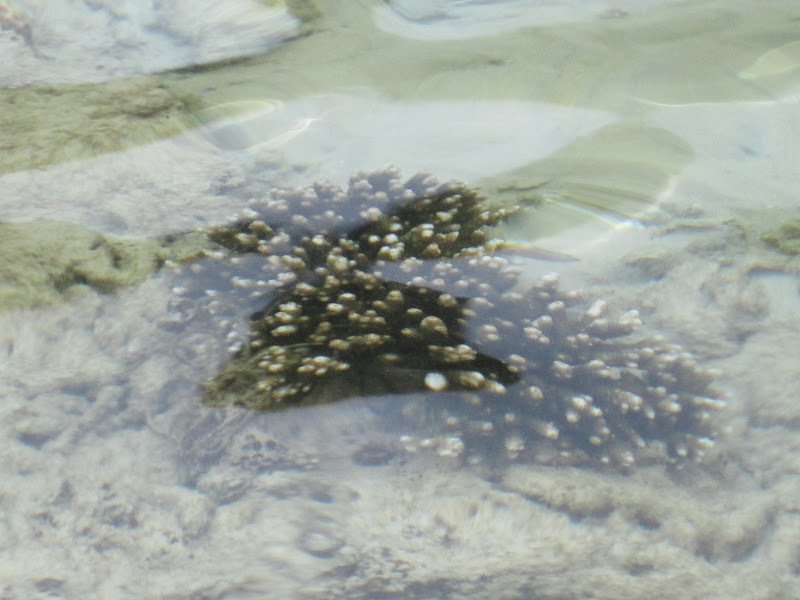 When the tide is out, we explored the wonderful marine life. 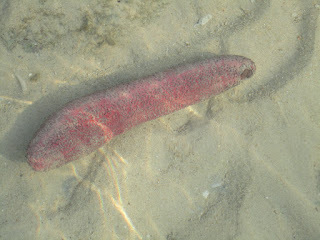 Some kind of thorny sea cucumber. Black sea cucumber. Lots of these in the water. Few colours of these sort of embedded clam. During the hot afternoon, we lazed around Salang Sayang cafe, idling, reading and staring out the sea. There are few monitor lizards living by the brook. Awesome view of the sunset. Night time at the jetty.